Gittisham’s history is an ancient one. Some properties in the parish can be traced back to the Domesday Book, and our Bronze Age ancestors also left their mark on Gittisham Hill where you will find several burial mounds. Down the ages, successive landowners have shaped the identity of the parish. They left behind various styles of architecture, including the Elizabethan Combe House, the 17th-century Town Farmhouse, the rendered cob and stone cottages that line the central street and the elegant 18th-century brick houses rising from the east end of the village. The majority of the buildings in the village are listed, and almost the whole village has been designated a conservation area. 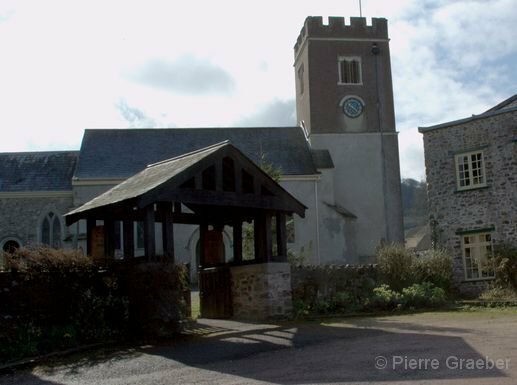 The Grade I-listed St Michael’s church is described by Devon historian W G Hoskins as ‘exceptionally attractive.’ Built in the early English and Perpendicular style of architecture, it has many points of interest, including box pews, a wagon roof and some 16th-century glass. Inside you will find several fine monuments to the families who have owned the land around Gittisham. Henry Beaumont, whose family inherited the Combe estate in 1453, is remembered with an effigy in alabaster, Purbeck stone and black marble. Not long after his death in 1591 the estate was sold to the Putt family, and remained in their name for more than 200 years. One of their number, Tom Putt, is said to have lent his name to an old variety of apple. Memorials to members of the Marker family can also be found in the church. Owners of the Combe estate since 1846, much of the land in the parish is in the hands of Richard Marker, who until recently owned most of the properties in the village as well. The village has maintained a diverse mix of people employed by the estate, as well as retirees, craftspeople, agricultural workers and families. In the early 1980s an area of agricultural land to the east of the parish at its border with Honiton was developed into residential properties, marketed under the brand of Gittisham Vale. This area is home to a large number of retired and semi-retired people, as well as a handful of families with children.